Don't mess around with me.....I'M EVIL. 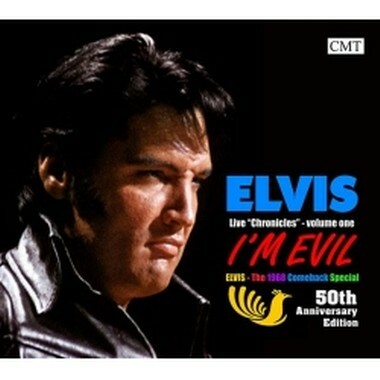 This year marks the 50th anniversary of Elvis legendary "Comeback Special" . Since the performances can not be beaten, the best thing for us to do would be to present them in the same way as they were recorded... but since that has been done over and over (and over and over) CMT is proud to present this STAR production , which is the best release containing the 1968 recordings.....in 50 years!! Much time and effort went into this release, some live tracks have been "spliced" from different shows, some studio tracks have been re-created and sound breathtaking! The live tracks are blended very cool, so you get the feeling you are listening to a complete show. Probably THE highlight is the "complete" version of Trouble/Guitar Man, cool edits make this work very well and makes the track even more "Evil"
Some tracks have been shortened to make it a different listning experience, "That's All Right" for example is presented just like the original 1954 version, with no repeating versus and chorus.